Plummeting home values during the housing crash turned an onslaught of single-family homes into investment rental properties. A new study on this topic by apartment search website RENTCafé looks at how many single-family homes were added to the market during this period and how they compare to rental apartments. The study reveals that single-family homes for rent grew twice as fast as rental apartments during the ten-year period immediately following the housing crisis, which is especially noteworthy given the real estate industry’s intense focus on apartments in recent years. 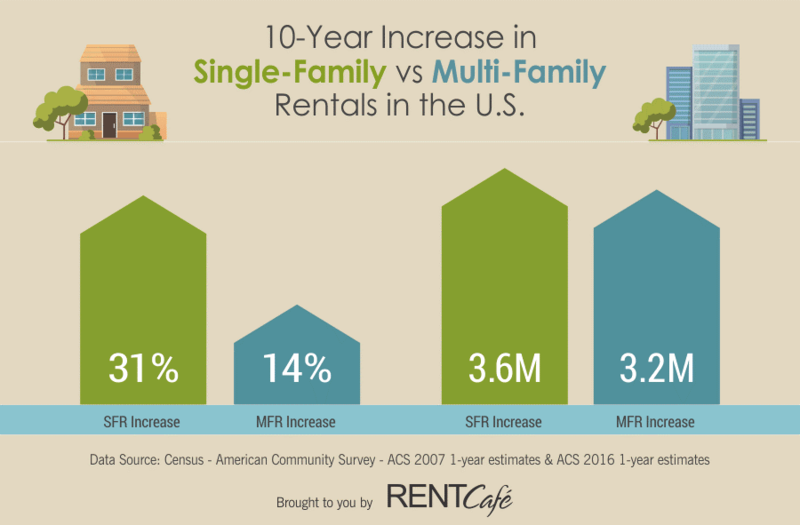 Using U.S. Census estimates, the RENTCafé study found that between 2007 and 2016 the number of single-family rentals in the U.S. increased by 31%, a net gain of 3.6 million rental units, while the number of apartments increased by 14%, a net gain of 3.2 million rental units. In total, the stock of rental houses in the U.S. as of 2016 was over 15 million units and the total stock of multifamily rental units was 26 million. Several investment firms took advantage of the sharp drop in home values in certain metro areas to buy single-family properties and turn them into rentals. Institutional investors, however, hold only about 2% of the market, according to the Urban Institute, while 45% of these rentals are owned by individual landlords with just one unit. 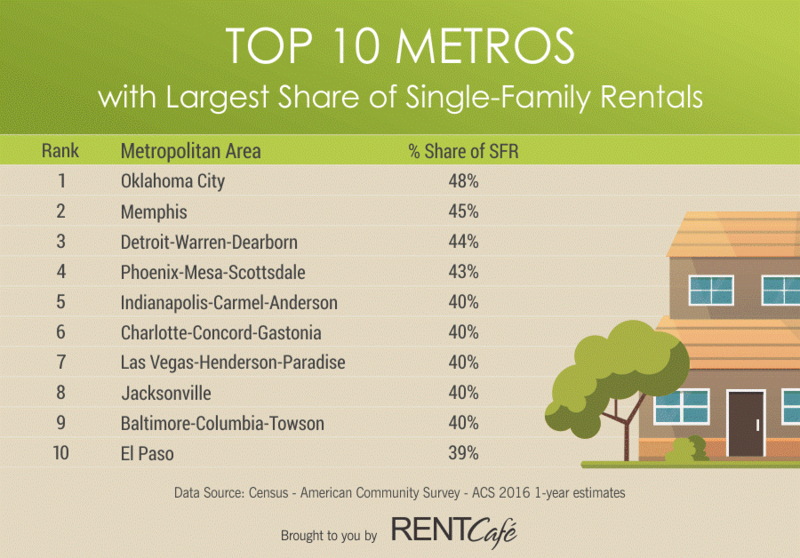 The metropolitan areas with the largest shares of single-family rentals are Oklahoma City, with almost half of its rental stock in the form of single-family homes, metro Memphis with 45% of rentals single-family houses, and metro Detroit with 44% of its rental stock. The Phoenix metro housing market was one of the more severely affected by the crisis, with tens of thousands of homes turned into rentals during this time. Currently, 43% of the rental stock in metro Phoenix are single-family homes for rent.